Since our last update I've travelled nearly coast-to-coast and settled back somewhere in the middle. 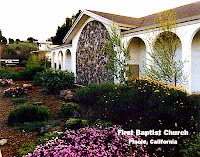 On 7 November, we met with the people of Community Baptist Church, San Luis Obispo, CA. We took an extra opportunity on that Monday to get to know Pastor Shanks and his family. It was encouraging to me to get to know this group of faithful believers reaching out to their changing community. Next, we went to Lubbock Baptist Temple. Since my aunt lives in the area, we invited her along to the meetings when we presented our ministry; we were glad for the opportunity for the kids to meet her. Lubbock Baptist Temple was a delight to get to know, and we think they may become our partners in the future. After that I flew via Charlotte, NC, to Atlanta for the ETS conference. Like last year, the conference proved an encouragement to delve deeper into the study of the Scriptures and a great opportunity to catch up with friends from my time in seminary. I was grateful for the opportunity to hear directly from authors I've read on topics I will be teaching on next semester. The weekend after Thanksgiving, we went to Liberty Baptist Church in Grand Junction. We knew we had planned our timing perfectly when we found out that we would have a chance to enjoy a post-Thanksgiving pie fellowship at the church! We were glad for the opportunity to get to know them better. They were also kind enough to house us until we had a break in the weather to get to Denver on the way home. Since then we have been saying our goodbyes to our partner-churches here in El Paso. We visited Sun Valley Baptist on 5 December and Grace Bible Fellowship over the last two Sundays. We will miss all these folks as we go on to Zambia as their representatives for Christ. I have been using some of the down time from meetings to plug away at my notes for Apologetics and OT Prophets. It is has been a delight to study the prophets especially during this time of year as we look forward to Christmas. Their vision of David's final Heir and the kingdom he would bring offers fresh perspective and real hope when the world offers only superficial celebrations. Before Christmas I am hoping to travel to Albuquerque to pack up and store some of our stuff here and to get rid of some of our stuff there. So there's one more car trip before the long trip up to New York. Our plan is to spend some time with Jenny's family and our partners at New Testament Baptist in Syracuse, NY. That's from Christmas Day until we leave for Michigan in the middle of January. After just a brief time with our sending church and friends at InterCity Baptist, we fly to Zambia. Pray that God keeps us safe and healthy during this time of travel. Pray also that God would use my preparation time to grow me spiritually so that I am equipped to teach his word in Zambia. Thank you for keeping us in your prayers. I am thankful for a very comfortable bed, wherever God has chosen to take us in the United States. I am thankful that Josiah ate his turkey without a battle this year. I am thankful that I can see my computer desk again. Being gone for a month can put you a bit behind on mail. I am "grateful that God has given us not a day, but an eternity, to thank him for his immeasurable grace in Jesus Christ" (Bob Kauflin). I am thankful that I had something other than shopping that I needed to do on Black Friday. I am thankful that the Bible is so readily available in my first language. I am thankful for Pocket Testament League, for example, making their gospels of John available for free/cheap. I am thankful for Wii Fit Plus on days like Thanksgiving Day when I don't get up early enough to walk. I am thankful for a final opportunity to present our ministry this weekend. Partners come through presentations. I am thankful for my little boy who asks, "Why does creamer make coffee light, but not sugar?" I am thankful for my littler boy who introduces Josiah to complete strangers without prompting. He's a social little fellow. I am thankful for my wife. I think she likes me. I am thankful for Weetabix; they're unbeatabix. I am thankful for a place for us to stay while we wrap up this part of deputation. It's good to have family on my side in this mission. I am thankful to be wrapping up this part of deputation. I am thankful for our current individual and church partners who are faithfully supporting our ministry. I am thankful for three churches and one individual family who have all recently indicated that they plan to become our regular financial partners in the near future. I am thankful for a God whose love for me does not depend on my love for him but rather secures my love for him. I am thankful for God's Son whose blood-bought benefits are not earned by my purity but rather constitute my purity. I am thankful for Christ's Spirit whose faithfulness does not depend on my faith but rather sustains my faith. I am thankful for a Church whose Head is reigning, whose Foundation is incorruptible, whose charter is unassailable, whose mission is unstoppable, and whose innumerable, worldwide, millennia-spanning membership shall be one day be both whole and pure. 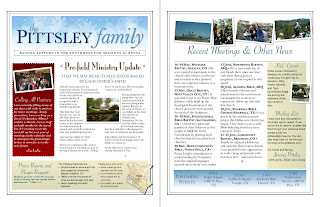 Along with my most recent newsletter, I sent a wish list to our recently visited churches. As we begin to transition to overseas ministries, some churches have asked for ways they can help us with one-time gifts because long-term financial commitments are difficult to make in the current economy. With that request in mind, I have assembled the following list of one-time needs and requests for our time in Zambia. Please don’t feel in any way obligated, but if you or your church would like to help provide for part or all of one of the following requests, we would be grateful. *Travel costs for our transition to Zambia have been substantially underwritten by recent extraordinary gifts from supporting churches , but Grace Baptist Mission forwarded us the majority of the funds to be repaid as the Lord provides. Let me know if you would like to help us get on our way! Thank you for your continued prayers and support. Here's an overview of the last handful of months (August through October). Text version follows the link to the print version. Recently I reembarked on a journey through the missions text, Let the Nations Be Glad! In the introduction the author, John Piper, tempers excitement about the progress of the gospel in places like Africa and Asia with the tragedy of a similar spread of the cancer of the prosperity gospel. He quotes one African preacher: “Many are ignorant of the fact that God has already made provision for his children to be wealthy here on earth.…Break loose! It is not a sin to desire to be wealthy” (3rd ed., p. 19). Friends, the only effective weapon against this kind of teaching is the exposition of the clear Word of God. And training men to do that is at the heart of our mission! 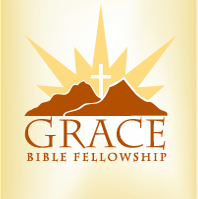 8-Aug: We were grateful for an opportunity to present our work to Grace Bible Fellowship, El Paso, TX. Jenny and I treasure the friendships we have been able to strike up with the folks of this church. 29-Aug: We had the great opportunity of taking a follow-up trip to Rockwall Bible Church in the Dallas area. We especially enjoyed the chance to get to know a family there who is beginning preparations for missions in Uganda. The Lord is sending out labors into his harvest! 10-Sep: We received notice of an urgent need for a teacher in Zambia for all of 2011. After giving time to prayer and fielding advice from many pastors and friends, we ultimately accepted the assignment. 19-Sep: We recited two chapters of Revelation by memory with Grace Bible Fellowship as part of a project to recite the whole book in a single morning service. 3-Oct: We met with Immanuel Bible Church in Scottsdale, AZ, near Phoenix. We were inspired by Pastor Matteson’s skill in leading his new small group, carefully mixing instruction with thought-provoking discussion that Sunday. 6–9-Oct: I took a few days to go to Albuquerque alone to go through our stuff in storage there. I think I'll need another trip or two before I have what we need for Zambia. 10-Oct: We visited Sun Valley Baptist again, and I had the opportunity to preach and discuss some of my plans for the upcoming months. We are thankful for the faithful ministry of this church—now serving for over 50 years! 17-Oct: We enjoyed our time with First Fundamental Bible Church in the LA area. Their love for expository preaching was refreshing for me to see. 31-Oct: We returned to another home away from home at Crossway Baptist Church in Bakersfield, CA. It was good to see them again and update them on the Zambia project. On our way back from our visit with Rockwall Bible Church we visited the Ft. Worth Zoo. our visit was quick, but the kids seemed to like it. Jonas found the snow tiger intriguing, repeating “diddy” (kitty) over and over as he pointed. Yes, Jonas, big kitty. Praise the Lord (1) for friends old and new who are becoming committed partners in ministry, and (2) for the opportunity to serve during 2011 in Zambia. Please pray (1) for smooth and rapid preparations for travel to Zambia, (2) for a solid and helpful teaching ministry in 2011, (3) for the rest of our budgeted financial support for Kenya. Thank you for your prayers and partnership in the gospel! The last couple of weeks have brought about some significant changes in our plans for the immediate future. On 10-Sep I was contacted by my home church pastors about an urgent need and opportunity. 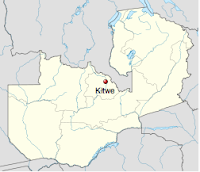 Central Africa Baptist College in Kitwe, Zambia, was looking for qualified Bible teachers to come for a year to fill in for recent staff changes and missionaries on furlough. InterCity recommended that I seize the opportunity and gave me time to pray about it and seek counsel. I am so thankful for the many new friends that I have come to know over the last year and a half. I spent a couple of hours that weekend contacting a number of wise pastors and other church leaders who asked me a number of good questions, prayed with me, and gave me sound, biblical counsel. The church leaders I have spoken to have been unanimously supportive of InterCity's recommendation to take the opportunity. So in the early morning hours of 20-Sep, I agreed to the contract via email and confirmed my intent to teach at CABC for 2011! We look forward to this hiatus in our support-raising efforts for a number of reasons. (1) The privilege to train men for Christ full-time is something I have been praying and preparing to do (academically and financially) for more than a decade. It is so good to get to work! (2) Taking this position would provide me with valuable ministry experience for a lifetime of ministry in Kenya. (3) It would give me a working model that I can adapt for the school we plan to start near Nairobi. (4) Also a year of ministry in Subsaharan Africa will serve to confirm our calling to this kind of work. (5) Relatedly this opportunity would add to my ministry credibility for finishing up deputation in 2012. As churches pray for wisdom about investing their resources, they often give ministry experience significant weight. So it is our prayer that, while we may arrive in Kenya a bit later, we will have less total deputation time. We have loads of work to get done before that we leave. Passports, visas, shots, packing, visiting family, and a number of church meetings lie between us and our departure in mid-to-late January. Please pray that God provides funds for travel, one-time expenses, and other ongoing needs. Pray that documentation would progress quickly and that our little ones will bear up under the stress of travel, and shots, and the transition. Pray for my preparation. I am already studying now for one course and others will be added to my load as we approach. I yearn to make a positive difference for Christ's name in the lives of these men. Praise the Lord for this exciting opportunity! God has provided through our partners, and our current support level is nearly sufficient for this term in Zambia. What a God we serve! Since our quarterly newsletter, we've had the great opportunity of taking a follow-up trip to Rockwall Bible Church in the Dallas area. The pastor and much of the youth group were out of town, sharing the gospel on a missions trip to Washington, D.C.; but we enjoyed the chance to get to know many others in the church. I was particularly excited about a family who is beginning preparations for missions in Uganda. The Lord is sending out labors into his harvest! We look forward to seeing what God has for this missions-minded church. Just before that we presented our work at Grace Bible Fellowship. Jenny and I treasure the friendships we have been able to strike up with the folks of this church, and it was good to have an opportunity to present our work to all of them and to preach in the morning service. Please pray as I continue to make calls to pastors for meetings. I am turning the corner now and beginning to concentrate almost entirely on next year's meetings in the Midwest. We are looking forward to what God has for us there and hope that this will be the final leg in our journey to full-time ministry in Kenya for the sake of his name. The last few weeks have been crammed with calls to pastors to set up meetings in churches. The calendar for the next year and half is beginning to fill up. Next week we are headed for our first trip to the Dallas region as we visit a fellow DBTS grad and the church he pastors in Paris, TX. From there we are visiting the folks at Community Baptist in Brighton, CO, again. We will be helping with a few practical needs and filling the pulpit while the pastor is on vacation. God is good to provide these opportunities to serve. Those who follow us on Facebook or Twitter know that Jenny and I took a quick trip to Albuquerque recently to sift through storage. There's still lots of work to do before we've made all the necessary decisions on what comes with us to Kenya and what goes on sale. It's sad sometimes to part with items that often carry sentimental value, but we are excited to be making practical steps toward our departure to Kenya. Speaking of departing to Kenya, my friends and coworkers, the Huffstutlers, will be leaving the country before my next update. They have finished raising support, and they are now completing the packing stages. It's so good to see them reach the end of their deputation trail and graduate to ministry overseas. Please pray that we are able to continue to fill up our schedule and that our meetings result in more partners in our ministry to Kenyans. Since we have been back from our tour of the West, we have been spending our time touching base with two churches where we made a few friends last year. Two weeks ago, we returned to Northwest Baptist Church. If you have been following us for long, you'll know that Northwest Baptist became our home during the months leading up to Jonas's birth. We've seen much less of them since that time, so it was good to visit. We are so thankful for their partnership in the gospel! Last Sunday, we visited Alameda Bible Church. This was the first church we visited when we moved to Albuquerque, and we have enjoyed continued contact with them since. It was good to see a number of familiar faces and a couple of new ones during our visit. Their friendly welcome and attentiveness to the word was encouraging to me. I am currently filling my days with calls to pastors for more meetings. At any given time, I am working on a list of 50 churches. When I contact a church, I cross it off and add another to the top of list. It's exciting to see the Lord fill up the next year of meetings in the calendar and to anticipate the friendships he has in store for us in the near future. We just returned from our brief tour of the West. In the course of our journey we visited or traveled through New Mexico, Colorado, Utah, California, and Arizona before finally returning to Texas. 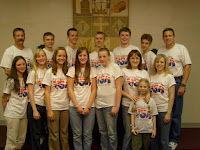 First we went to Greeley, Colorado, for a missions conference at Westside Baptist Church. It was exciting to participate in the church's first mission conference and to watch as they planned their own outreach ministry to a local university. We had the privilege of sharing a number of meals with our fellow missionaries and a handful of the church members; it was encouraging to see their passion for Christ and for the nations. After stopping overnight in Grand Junction, CO, we rolled into West Valley City, UT, where we stayed with Pastor Matt Johnson. It was neat to get to see Pastor Matt wisely build up the theological foundations of the church and unite them around the truth of the Scriptures. Jenny and I especially enjoyed the evening class he taught some of the members at Grace Baptist Church on Bible interpretation. Next we stayed in San Leandro, CA, where we participated in the church-planters' conference of International Bible Baptist Church. The majority of the church members are of Filipino descent, so we had some delicious Filipino food while we were in attendance. It was so exciting to see the vision and passion of these men as they sought to fulfill the Great Commission by planting local churches that in turn plant local churches. Our shared commitment to the centrality of the local church was a recurring theme throughout the week. I was humbled to have the opportunity to preach and to present my ministry plans to these committed men and the church. Finally we visited Hope Community Bible Church in North Hills, CA. We stayed with the pastor and his family while we were there. Pastor Leigh's commitment to understanding the Scriptures from the original languages spurred me on in my own studies. We were also thankful to get to know a family in the church who is preparing to go to Japan as missionaries. I was sad to have to leave these folks behind when Monday came around. Please pray that we would be able to recover soon from the colds all of us caught on the road. We hit the road again 12-Jun. Continue also to pray for safety, more meetings, and more partners to help us to get to Kenya quickly. Praise the Lord for safety and for bringing us into fellowship with his people all over the region. Here's an overview of the last handful of months (February through April). Text version follows the link to the print version. 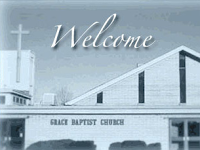 On 14 February we visited Grace Bible Fellowship in El Paso, TX, for the first time. We have done our best to get to know some of the folks here when we are not out of town, and the effort has been richly rewarded. Jenny and I have been drawn to the gospel through their ministry and our new friends there are already becoming dear to us. Proclaiming the Gospel to Others—and Ourselves! One of the highlights of the last few months in El Paso has been the time that artist and Christian apologist Jay Wegter came to teach and train the folks at Grace Bible Fellowship for a weekend. Members of the church went with him to a local outlet mall to reach out to the lost and to put into practice some of his evangelism training. I found his method of opening the conversation especially helpful. I am eager to find more opportunities to employ the tools he gave us. But it wasn’t just presenting the gospel to the lost he talked about. He also spent some time teaching about preaching the gospel to ourselves. Why should we do that? Well, the human soul seems to always run after some sort of performance-based approach to God. Even as Christians we need to continually remember that it is the gospel that gives us permission and boldness to approach God. The gospel cuts the throat of our ingrained arrogance; it stops us from thinking that our own performance is good enough for God. The gospel also shakes us out of our tendency to withdraw from fellowship with God because of a lingering guilty conscience for past failure. Whatever our self-centered tendency is, the gospel is the weapon we need to conquer it. And it is this powerful gospel that we have the privilege of proclaiming to the nations! • 3-Feb, Faith Baptist, Artesia, NM • We enjoyed our brief time with this visionary and growing church and have good hope of seeing more of them in the future. • 6-Feb, Alameda Bible Church, ABQ • I was delighted to have the opportunity to see these folks again and to give a devotional at their Valentine’s Day Banquet. • 28-Feb, Temple Baptist, Hobbs, NM • I was struck by the genuine care, trust, and fellowship shared by the pastor and flock here. 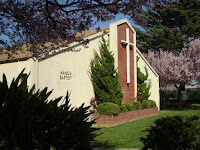 • 7-Mar, Manor Baptist, San Leandro, CA • I was encouraged to see how intentional this church is about making their missionaries part of their regular corporate prayer life. • 10-Mar, First Baptist, Pinole, CA • I met a missionary to the deaf in the San Fran area during an update visit with this church. He was a memorable encouragement to me. • 14-Mar, Community Bible Jackson, WY • It will be a long time before I forget the fraternity of spirit I enjoyed with the Edmondsons and the other members I was able to get to know from this church. • 18-Apr, Grace Baptist, Farmington, NM • It's always good for us to see a church like this who knows and even visits their missionaries! • 25-Apr, Western Avenue Baptist, Avondale, AZ • We love coming across churches like this who share our heart for both deep theology and deep fellowship within the body. While Jonas has been learning to crawl and cruise, Josiah has begun to explore music more and more. He loves to explore music websites like sfskids.org and has nearly memorized a number of songs that teach multiplication tables of all things! • Opportunities to serve and to be encouraged at Grace Bible Fellowship. • Safety over the thousands of miles travelled already this year. From northern California I left for Jackson, WY. On the way, I had a great opportunity to visit Matt Ortega, pastor of Lighthouse Baptist Church near Salt Lake City, UT. I also added Idaho to the list of states that I've been able to visit during deputation; it took me a couple of hours to cut across the very southeastern corner of the state. It will be a long time before I forget the fraternity of spirit I enjoyed with the Edmondsons in Jackson. I was able to present our ministry to their church, Community Bible, and take part in their Sunday evening Bible study. I came out of the weekend deeply refreshed and challenged in my zeal to know Christ and wishing for more time to get to know this couple and the church. Since then I've been working on a few projects that had been waiting for a break in scheduled meetings. I moved loads of stuff from where we were staying in Albuquerque to storage and to where we are now staying in El Paso. (Please email me if you need a US mail address update.) Among the other things that came down with me, Jonas's crib has finally come into use. Over the last week or two, we have also been getting to know some new friends at Grace Bible Fellowship here in El Paso. We hope to get involved frequently at this church when we are not in meetings elsewhere. We're so thankful for the way God has used his people to strengthen our faith and provide for our needs. We're also thankful that he has allowed us to recover from a recent round of the stomach bug. I think we all got it, but as of yesterday all of us are healthy again. Please pray that God would continue to use meetings for the mutual encouragement of his people's faith. Pray that time spent presenting the work and cultivating relationships would result in long-lasting partnerships that move us along to Kenya quickly. The last few weeks have been full of travel for me. If you've been following us for long, you know that this is no news. What's different is that I've been traveling solo. With Josiah and Jonas coming down with a nasty cold and to ease our accommodation needs, we decided that I would do these last two trips alone. Sunday, 28 February, was a long day for me. I left for Hobbs, NM, from El Paso, TX, late Saturday night and arrived early Sunday morning. During the Sunday school hour, I had the privilege of observing the relationship the pastor at Temple Baptist has with his people. Genuine care, trust, and fellowship seasoned the lesson time. After the services, the pastor's family treated me to steak dinner--a delicious surprise! After presenting the work in the evening service, I made my sleepy way home and fell asleep immediately upon reaching my pillow. This last Sunday I was in San Leandro, near San Francisco, CA. In the AM service, Pastor Carruthers reminded the congregation of Manor Baptist Church about the importance of the doctrine of the inspiration of the Scriptures. I had an opportunity to talk to many of the members there in the morning, and presented in the evening. Repeatedly during my time there, I was encouraged to see how intentional they were about making their missionaries part of their regular prayer life as a church. This week I have been staying in Pinole, CA, with a church we've visited a couple of times before. Yesterday, Pastor Baker took me up on my general offer to help him as needed. I had the opportunity to get involved in weeding and clearing an area of property next to the church, to help the pastor list some books online for sale, and to work the DVD player and data projector for a ladies' prayer meeting. The missionary has a broad and satisfying job description; I love it! Please pray for the health of the kids and for my safety on the roads. After updating the folks here at First Baptist of Pinole tonight, I'll be headed to Wyoming tomorrow before coming home to the family next week. God is keeping us safe and giving us opportunities to develop friendships here with a view toward finding ministry partners for the work in Kenya. Praise him for his faithful love and his zeal for his glory among the nations! Here's an overview of the last handful of months (October through January). Text version follows the link to the print version. I had a well-appreciated opportunity at the beginning of this year to head back to Michigan briefly for an excellent missions conference at my sending church, InterCity Baptist. My own resolve for the mission was significantly strengthened by the worship, preaching, and workshops. Christians can be confident that they’ll encounter hardship, but they can also be confident that their light afflictions in this momentary life will gain for them weighty glory in eternity (2 Corinthians 4:17). God is so good to grant us an eternally worthwhile mission! 4 October, Santa Clarita Baptist: This church was very attentive to our ministry presentation, and I was able to discuss a number of good questions with members both during the presentation and after the evening service. 7 October, Pear Park Baptist, Grand Junction, CO: That night we were glad for the chance to take part in their prayer meeting. It was strikingly centered on praying for efforts to reach out to various unsaved friends and family of members. 11 October, Highlands Baptist, Colorado Springs: Two passionate commitments stood out as we visited this church: expository preaching and focused evangelistic training for the church membership. Though we had no previous personal connection with this church, I immediately felt the kinship we had in these common commitments. 21-25 October, Liberty Baptist, Dalhart, TX: We enjoyed big-time Texas hospitality during this missions conference in the heartland. They treated us to Christmas in October; Josiah was ecstatic! 8 November, Community Baptist, Brighton, CO: We were excited to see the Lord work among this church’s youth as they committed themselves to being bold as they shared the gospel of our Lord Jesus. 12-16 November, Calvary Baptist, Hollister, CA: The fellowship among the missionaries during this conference was especially sweet. The church's heart for missions and the cause of Christ was evident. 17-20 November, ETS Conference, New Orleans, LA: It was neat to present a paper and hear a few more, but the best part was seeing some of my professors and friends from seminary. I came back refreshed and recommitted to pursuing the treasures found in the Scriptures. 6 December, Lighthouse Baptist, Colorado Springs: We were thankful to visit this church because they were zealous about sound teaching and because the wise pastor works to keep the gospel central. 27 December, Sun Valley Baptist, El Paso, TX: I was grateful for the opportunity to serve between the holidays with this church; their ongoing partnership with us is a treasure we hold dear. 4-7 January, InterCity Baptist, Allen Park, MI: The SGI conference only happens every other year, so I was glad to have the opportunity to participate. The conference was followed by a helpful seminar for missionaries on learning a foreign culture. 10 January, Calvary Bible, Lucerne Valley, CA: It was invigorating to see what the Lord Jesus is doing there as his people are coming to a renewed zeal for proclaiming the gospel to their loved ones and friends. 24, 31 January, Crossway Baptist, Bakersfield, CA: I was pleasantly surprised to see how many in the church were not yet at Crossway when I presented there last year. I had the opportunity to present the work again as well as to preach to this vibrant congregation. They were an immeasurable encouragement to us. 31 January, Faith Baptist, Orange County, CA: This committed group of believers evidenced a deep-seated compassion for the lost in their own city and around the world. I'm thankful for their example. Josiah enjoyed his time with Addison and Sydney Brock while we stayed with the Brocks in January. He alternately acted the prince and the scary monster to the amusement of all. Traveling through Arizona, California, Colorado, Texas, and Utah, we’ve enjoyed some of the most beautiful landscapes in our nation. Praise God for these reminders of his majesty. With the addition of Jonas to our family, we’ve needed to update our presentation and prayer magnet. We praise God for bringing friends across our path who have helped us complete the update--all working for free or at cost! 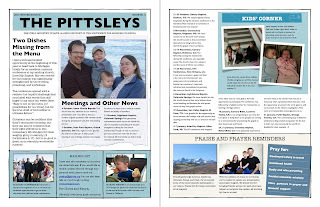 The Pittsleys have enjoyed a restful time over the holidays. At the beginning of December we presented our work to Lighthouse Baptist Church in Colorado Springs. I will long remember being thankful to visit this church because they were zealous about sound teaching and because the wise pastor works to keep the main thing (i.e. the gospel) the main thing. In between the morning and evening service at Lighthouse Baptist, we took the opportunity to visit the believers at High Country Baptist Church during their afternoon service. The weather prevented us from spending long there, but in the past I've enjoyed the doctrine class they do for adults in the afternoon. This visit was no disappointment! Solid doctrinal depth strengthens the soul for the task. We spent Christmas and New Year's in El Paso, TX. We were showered with gifts from family and from churches who are partnering with us. God has been so good in his lavish care for us through you. Thank you all who were a part of it. I learned a valuable lesson from the drought. You see, when the soil is rich and the rains are good, the trees on the property are healthy and strong.... When the drought comes, the trees are stripped to their bare minimum - it is survival mode. Anything that is not needed is cast off. Some of the trees lost all of their leaves in order to survive.... Now a few months later, they are full of leaves and flowers. The trials this past year have made me re-evaluate what is important and what is necessary.... Just like the trees, if you make it through this period, you can come out stronger and possibly bear even more fruit than before because you have focused on making the tree stronger. Tomorrow morning we're taking off for California. We have meetings there all the way through the 31-Jan. On the weekdays during the rest of the month, we'll be staying with the Brocks and helping out where we can with Crossway Baptist Church. We're eager to get involved directly in local church ministry and thankful to the Brocks for the opportunity. 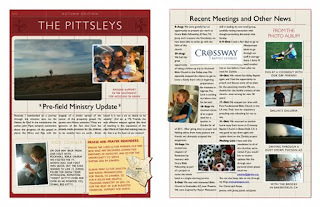 Please pray for health and safety, for more ministry partners as the church's we visited last year determine their budgets, and for our own growth in holiness and Christlikeness.